Tasked with developing a UAV to support forest fire fighting, UNB's Collaboration Based Robotics and Automations (COBRA) team won the design phase and placed third in the operational phase of the 5th Annual Unmanned Systems Canada UAV Student Competition. Held recently in Alma, Quebec, 10 university student teams from across Canada competed in the event which was hosted by Ville d'Alma at the Centre d’Excellence Sur Les Drones (UAS CE). Each team was tasked with automatically locating targets that would represent points of interest in an actual forest fire fighting scenario in the remote Canadian wilderness, using their own experimental unmanned aircraft flying under the control of autopilots. 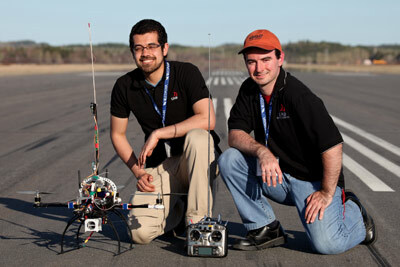 UNB's COBRA team is led by students Amr Nagaty and Carl Thibault. Who are both passionate about aerial robotics. With extensive experience with fixed wing and rotary wing platforms the team's work has been displayed locally and nationally including a spot on Daily Planet. For more information contact cobraUNB@gmail.com.